Published our chapter GIS Techniques in Archaeology: An Archaeoastronomical Approach. By J. Mejuto, J. Gómez Castaño and G. Rodríguez-Caderot. 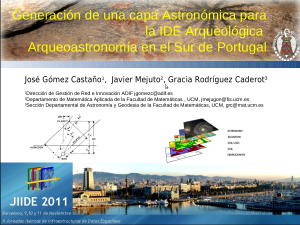 José Castaño contribution entitled “Astronomical layer generation for Archaeological-Astronomical SDI in Southern portugal” in the framework of the II Iberian Conference of Spatial Data Infrastructures that is been taking place from Novembre 9st to 11st in Barcelona.